Advantage Multi is known as Advocate in Australia. Joes sells the Australian packaged version of Advantage Multi (Advocate). Advocate offers protection against multiple parasites in one easy to administer topical monthly dose – no need to battle with tablets! 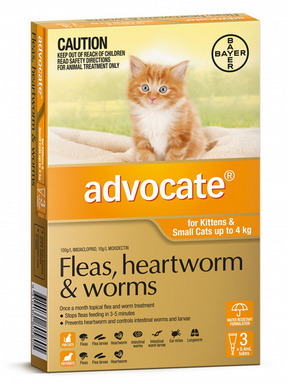 Advocate's unique formula prevents heartworm disease in cats and dogs while controlling fleas, roundworms and hookworms and ear mites in both species and whipworms, Sarcoptes and Demodex mites in dogs. Advocate works rapidly to control fleas, killing over 98% of adult fleas within 12 hours of application. Protecting your pet against common parasites has never been easier with this fantastic new product. Directions for use: Use the top of the cap to break seal of tube. Part hair between the shoulder blades until skin is visible. Place the tip of the tube on the skin and squeeze tube firmly to apply solution directly to the skin. I waited a little too long to reorder my usual flea and tick medicine. By the time I ordered this my boys already had some fleas. My normal brand would have taken a few days to kill the fleas but the next day, my boys were flea free. This is a win for me and I will use Advocate again. Vet told me he had experienced several 'fails' on the product I had been using and suggested I change to advocate. It covers all of the normal needs of pests and is simple to apply! No fails here! Not only good in treating fleas, but it also works for other parasites. Very effective and convenient to use. One solution for everything. Best product ever. It works for almost all usual parasites I know. And since it's not easy to treat your dog, having a one solution for everything is the solution. Effective. Best product for my baby! Easy to administer. And since it kills fleas and ticks and serves also as a heart worm preventive and wormer, it's very convenient for you only need to apply one treatment. For everything. Very great. Solves a lot of parasite problems!! Great value. Great product from Pet Shed. Will definitely order another box of this. Thanks Pet Shed! I've recommend Advocate to ever pet owner I know. Works best for my dogs! And this has been the only medication I've been using to them for months already. And they are all well. Great great solution! Advocate solves everything. Very thankful for this one. Easier to apply and makes my dog healthier. Not your typical flea control, since it also removes worms and protects your dogs from heart worms. Really a great value. Vet's prices are ridiculous. I need to fin an online alternative. And Pet Shed is the best place to shop!! Great meds here. I'm so happy I was able to find Advocate, coz that's what my dogs use.